President Pranab Mukerjee on Tuesday said former President APJ Abdul Kalam “strengthened” India’s defence and security while remembering his own interactions with the “Missile Man” since they first meet in May 1998 in the aftermath of the nuclear tests at Pokhran. Kalam, who fathered India’s missile programme, died at Shillong in Meghalaya on Monday night following a reported cardiac arrest. Mukherjee, who was on a two-day visit to Karnataka, cut short his programme listed for Tuesday and flew back to Delhi. Mukherjee, who was Defence Minister during the first term of the Congress-led UPA alliance (2004-2009) remembered how he had first met Kalam in May 1998. The then Prime Minister Atal Bihari Vajpayee had invited Congress leaders to be briefed about the nuclear tests. “Manmohan Singh, Sonia Gandhi and myself among others had gone. The technical aspects of the test were explained by Kalam. 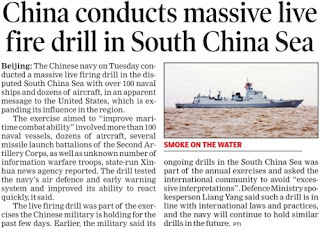 He was impressive in his presentation,” Mukherjee said. Kalam was the then Scientific Adviser to the Defence Minister. 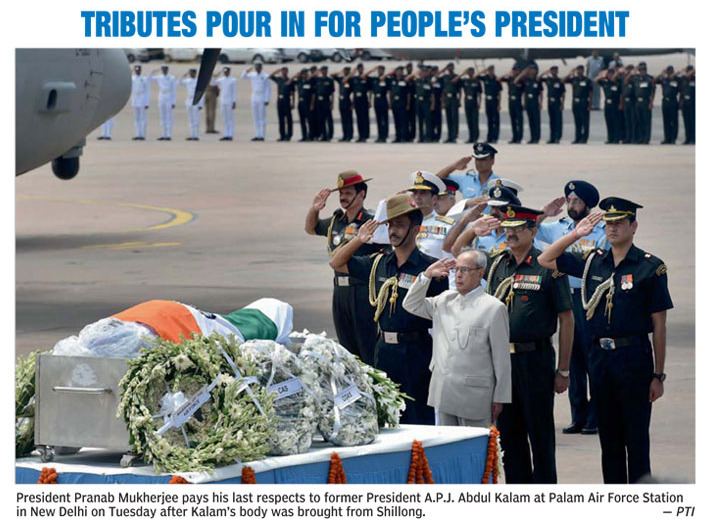 Mukherjee recollected that his personal interaction increased with Kalam in 2004. “I had joined the government as the Defence Minister in 2004 He was the Supreme Commander of the forces. He was keen on the BrahMos missile (a supersonic missile). With his direct encouragement, we have the BrahMos missiles in all three services. 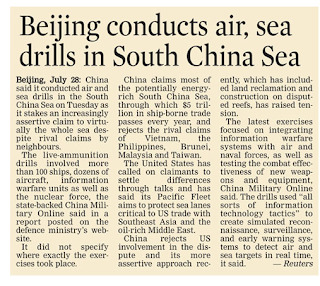 It is even exported,” the President said. “Kalam became the first President after 1977 to be elected unopposed,” Mukherjee said while recollecting that he received a copy of the Missile Man’s book ‘Beyond 2020’. “He used to encourage me to read and write,” he said. 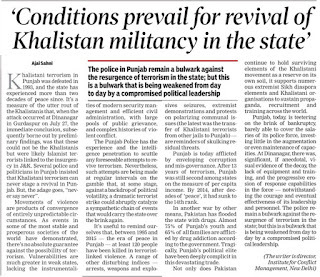 The Punjab Police successfully eliminated the three terrorists holed up inside a police station, but security experts are of the view that the manner in which the situation was handled left a lot to be desired. 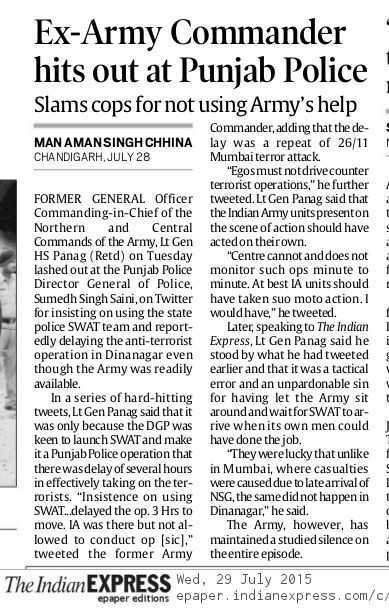 Not only were their gaps in inter-agency coordination and intelligence, based upon media reports and TV footage, senior retired officers opined the state police, including the much vaulted SWAT team that had carried out the mopping operations displayed lack of training, equipment and service discipline. 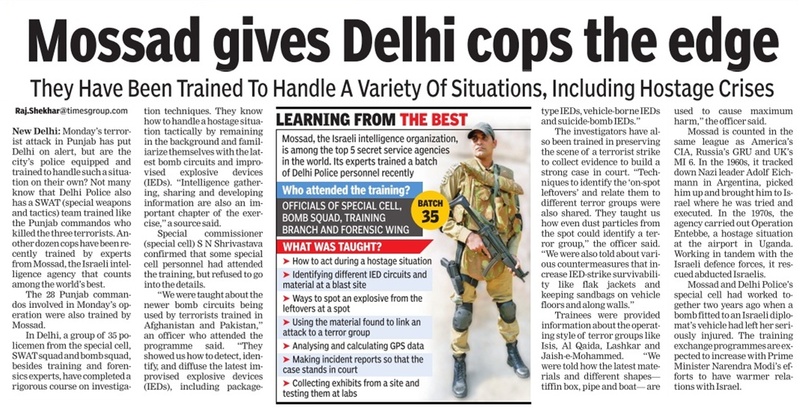 The manner in which the terrorists had laid explosives on the railway track, their choice of target and the weapons they were carrying led some experts to believe they were well trained and had a focused objective. But requisitioning the Army and then keeping it waiting for the SWAT team to arrive, they say, led to unnecessary delays that could have been counter-productive. The terrorists had reportedly infiltrated from Pakistan through the Shakragarh bulge along the riverine banks of the Ravi, the area that had also witnessed intense battles during Indo-Pakistani wars. 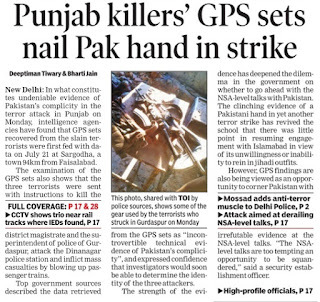 This is for the first time that a cross-border attack has been launched in Punjab. 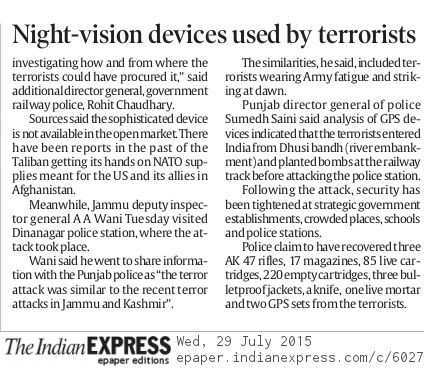 Even during terrorism days in the state, weapons were smuggled from across the border. 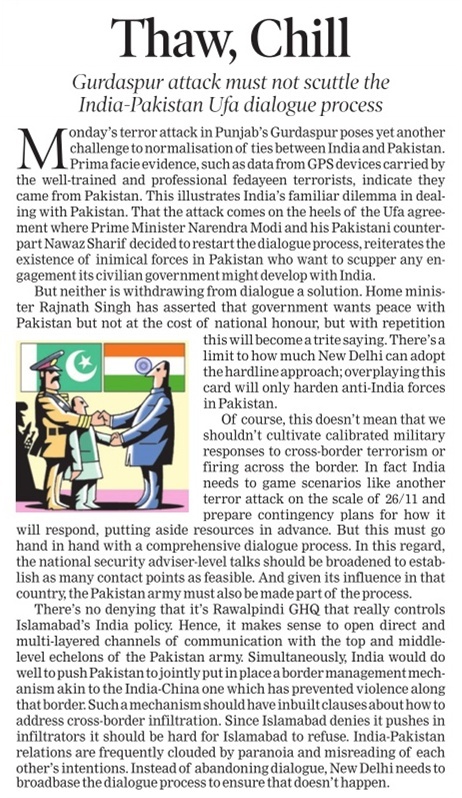 There is also a belief in the security establishment that yesterday’s attack could be an attempt to ridicule India’s strategy of “giving a befitting reply” to cross-border firing and terrorist incidents and also against operations perceived to have been conducted in Pakistan by Indian intelligence. “The Army deals with such situations regularly in J&K and there was no reason to first mobilise infantry troops located in the vicinity and then keep them deployed in the outer cordon waiting for police SWAT teams to arrive from far-off locations,” Lt Gen HS Panag, former GOC-in-C Northern Command said. 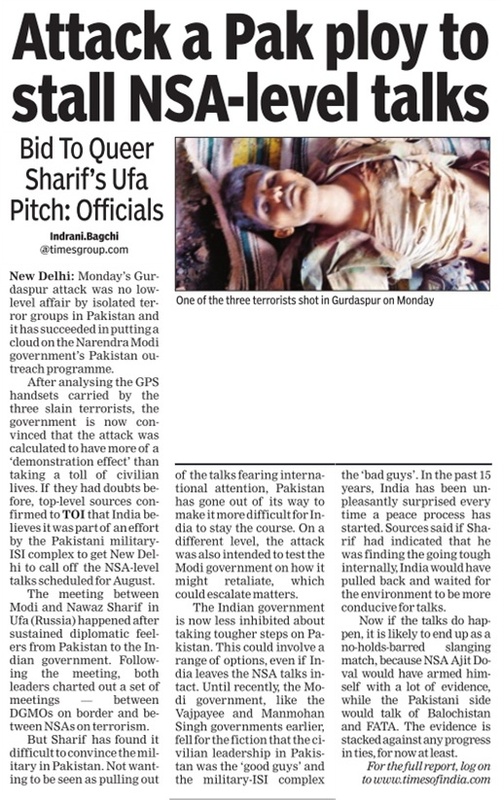 “Had the army been allowed to conduct the operations, they would have started early morning and finished soon instead of lingering till evening, thereby creating a greater risk for collateral damage or casualties being inflicted by the terrorists of security forces as well as civilians,” he said. 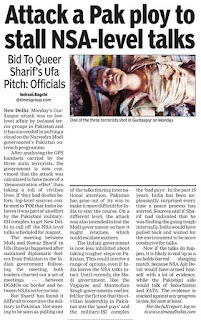 Brig Pradeep Sharma (retd), who has served with the National Security Guards, said the police could easily have used smoke bombs to flush them out and cut off water and electricity to the building to mentally wear them out. 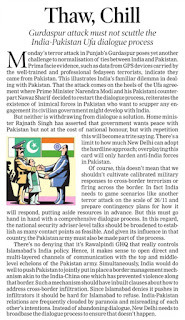 “Anti-terrorist operations are not about showing bravado. They are more about patience and psychological pressure. It was luck they chose to take over a police station,” he said. 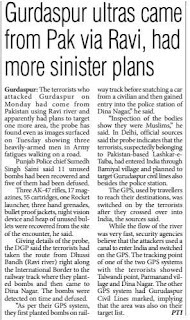 Punjab Police’s operation to gun down the three terrorists in Dinanagar on Monday was over in a mere 20 minutes, but the announcement was not made promptly as they suspected more militants may have been hiding inside the police station. 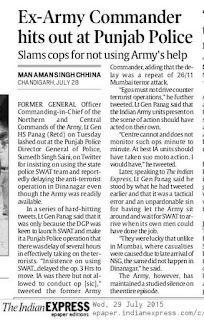 Deputy Commissioner Dr Abhinav Trikha and SSP Gurpreet Singh Toor today said both the Army and the Punjab Police worked on the assumption the entire day that there were four or more militants in the old DSP building in the police station. 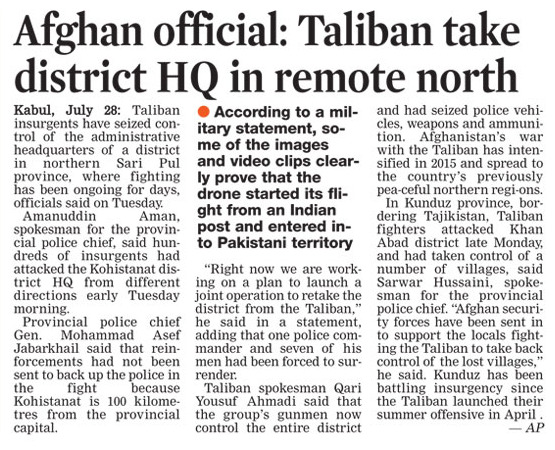 “We were not in a position to confirm whether the total number of militants was three or four,” said Trikha. “Though the terrorists were killed in just 20 minutes, the successful completion of the operation was not formally announced as the police’s SWAT (Special Weapons And Tactics) squad was trying to locate the fourth militant, believing he might have gone into hiding. 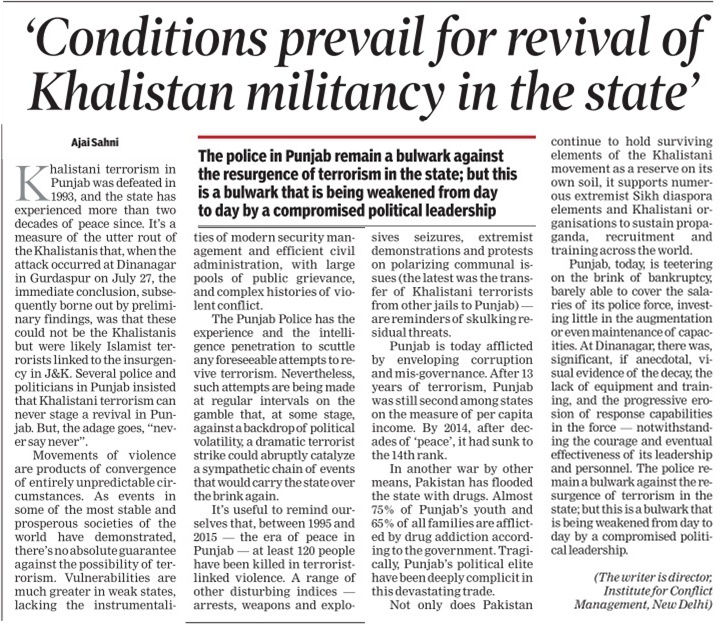 Even Kamaljit Singh Matharoo, whose Maruti car the militants had snatched before entering the police station, told there were police four terrorists, which gave credence to the assumption,” said a senior police officer. The situation could have been avoided had the police checked the footage of the CCTV camera installed at the entrance of the police station. “The CCTV footage clearly indicates there were only three heavily armed terrorists who had made their way into the police station,” said the officer. 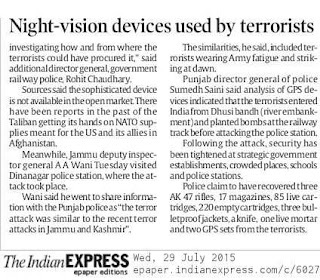 Initially, the cops claimed the CCTV camera installed in the police station was not working. 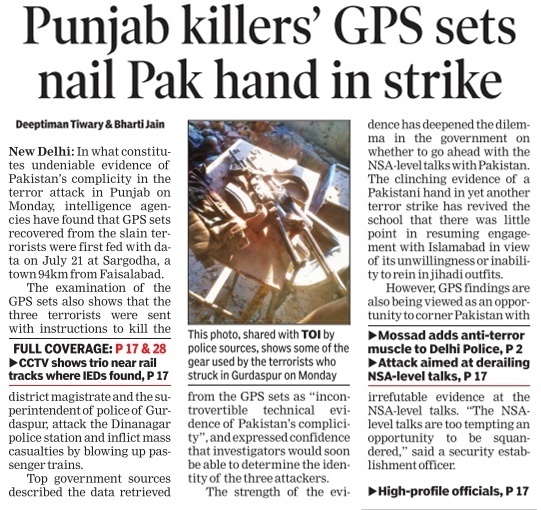 But some TV channels started showing the video footage of three terrorists making their way into the police complex. A team of forensic science experts from a laboratory in Mohali arrived at the police station today and collected samples from the complex. A bomb disposal squad defused eight grenades found at the site. 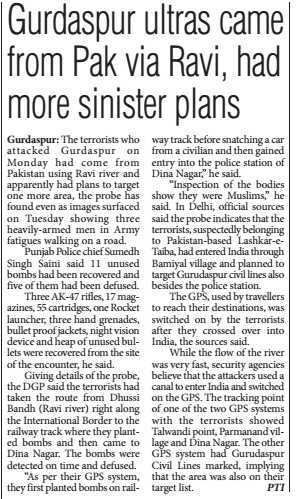 An officer said the bodies of the slain terrorists had been brought to the Gurdaspur Civil Hospital for a post-mortem. DGP Sumedh Singh Saini held a press conference at the Dinanagar police station today evening where he listed the ammunition found by the police from the site. Principal of Nehru Institute of Mountaineering (NIA), Col Ajay Kohtiyal was felicitated at a function held in New Delhi under the aegis of Uttarakhand Kala _Manch for restoring the disaster-affected region of Kedarnath to its old _glory in a year. The holy shrine was completely ravaged due to flash floods in 2013 and a private company was assigned the task to clear the debris and restore Kedarnath, but the said company failed to deliver on its commitment, _leaving the state government into the lurch. It was under such circumstances that Col Ajay Kohtiyal took the challenge of reconstructing the bridled paths and restoring the old glory of Kedarnath shrine, which is reverberating with the sound of temple bells _once again. Col Ajay Kohtiyal, while accepting the award, said the restoration of Kedarnath shows the power of the people of the state. He said the youth in his team took the challenge with full strength and vigour. They were able to prepare the trek routes and _open the shrine to the pilgrims by working under freezing temperatures on most occasions. Col Kohtiyal also informed the gathering about the work done at Kedarnath by his team. He said there was a need for reverse migration. The people who left the state should have love for their home state and should think of ways to develop their village. He also shared his experience in the Indian Army and said their sole aim was to serve the country. He said the people of the state should unite to work for the development _of the state. He welcomed the people to visit Kedarnath and see for themselves the amount of work done by the team from the NIM. A painting competition was also organised in which several students from the state participated. Col Kohtiyal said top 10 paintings would be taken to Uttarakhand and will be kept at the _CM’s House, Governor’s House and other important places as motivation to the kids. DIG GS Martolia and ADG Post guard Rajendar Singh were also honoured for their contribution on the occasion. President of the organisation Brijmohan Upreti and general secretary Pawan Maithani said Kedarnath was standing on its feet once again due to the efforts of Col Kohtiyal and his team who worked day and night to restore its old glory. 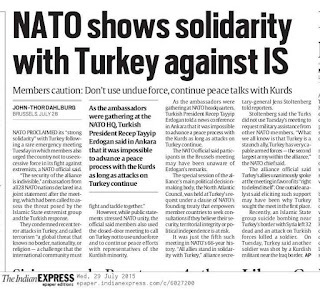 NATO gave Turkey its full political support in fighting militants in Syria and Iraq at an emergency meeting on Tuesday but several nations urged Ankara not to undermine the Kurdish peace process by using excessive military force. Following a 90-minute meeting in Brussels, Turkey won the backing it sought for stepping up its role in the U.S.-led fight against Islamic State with air strikes. Ankara made no request to its 27 allies for military help and NATO Secretary-General Jens Stoltenberg noted that it had the second-largest army in the alliance. Instead, the meeting heard how Turkey was carrying out President Tayyip Erdogan’s sudden change in strategy against Islamic State—an al Qaeda breakaway that controls swathes of Syria and Iraq—and Kurdish militants based in Iraq. 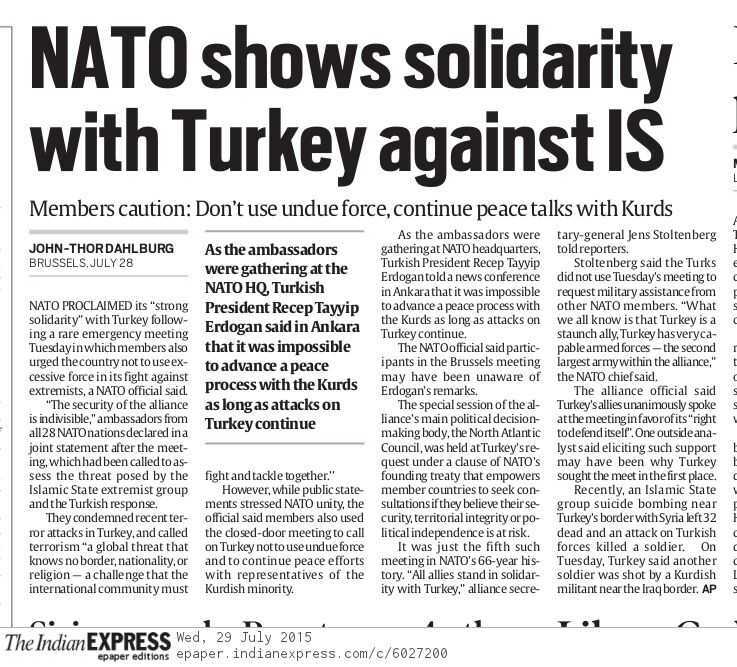 “We all stand united in condemning terrorism, in solidarity with Turkey,” Stoltenberg told a news conference. The killing of 32 young students in a Turkish border town near Syria last week drove Ankara into battle against Islamic State, a move NATO welcomes, shedding its previous reluctance. MEERUT: Taking cognizance of a recent statement by defence minister Manohar Parrikar that the Indian Army was short of 10,000 officers, the Central Command of the Army has taken an initiative to reach out to students to encourage them to join the forces. Sources at the UP West Sub Area Command based in Meerut said, "Army Outreach Programme' aims at enhancing students' awareness about the opportunities that await them in the Army. In a bid to motivate children and attract the desired talent for the Army, Lieutenant General Rajan Bakshi, Army Commander, Central Command has taken an initiative to reach out to children across the seven states." Central Command, with its area of responsibility stretching from 'Himalayas till Bay of Bengal' and covering the seven states of Uttar Pradesh, Uttarakhand, Bihar, Jharkhand, Odisha, Chhattisgarh and Madhya Pradesh, contributes approximately 40% of the soldiers in the Army. According to a senior Army officer at the Meerut-based command centre who did not wish to be identified, "Selected serving officers, including lady officers, have been trained in Lucknow under the personal guidance of the Army Commander. These selected officers visit various colleges and schools and address the children to enhance awareness about the opportunities that await them on joining the Army along with leading an achiever's life." Though this is not the first time such an initiative is being taken up. The initiative began on a trial basis in 2014 by Bakshi in which the Army officers visited 72 colleges and 87 schools across the seven states wherein nearly 27,000 children benefited from the 'Army Outreach Programme'. 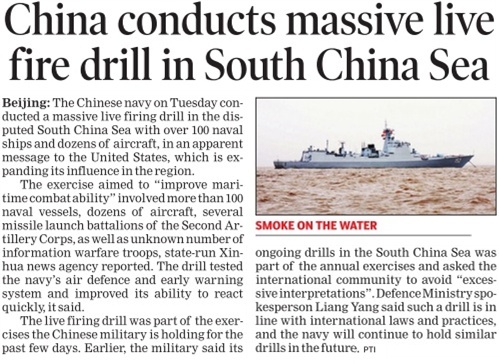 However, this year the exercise becomes all the more relevant especially after defence minister's remarks regarding shortage of officers in the Army. 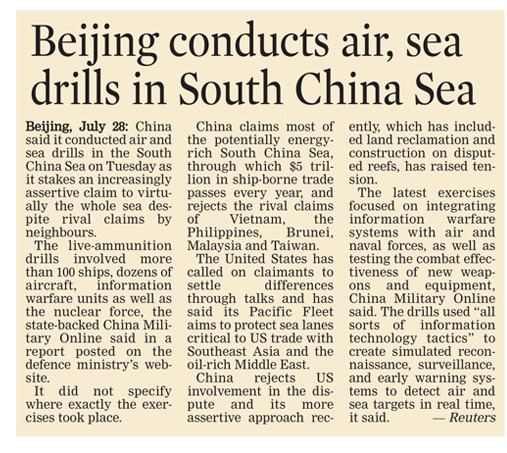 "This year, the 'Army Outreach Programme' will be more aggressive one," said an official. 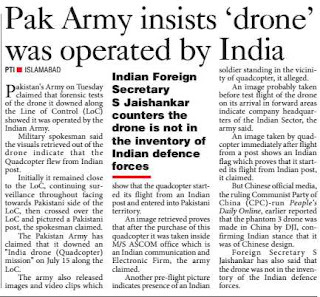 A day after the Pakistani Army released pictures recovered from a memory chip of a quadcopter which it said was flown by Indian agencies allegedly for espionage, the Mumbai-based company from whom the unmanned aerial vehicle (UAV) was reportedly purchased has claimed that the Indian Army never bought it from them. 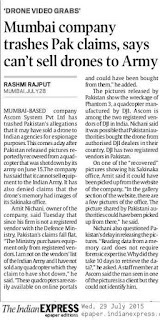 Amit Nichani, the owner of Ascom System Pvt Ltd, told The Indian Express Tuesday that since he was not a registered vendor with the Ministry of Defence, the claims by the Pakistani Army that it might have been purchased from Ascom did not hold ground. “The defence ministry purchases equipment only from its registered vendors. 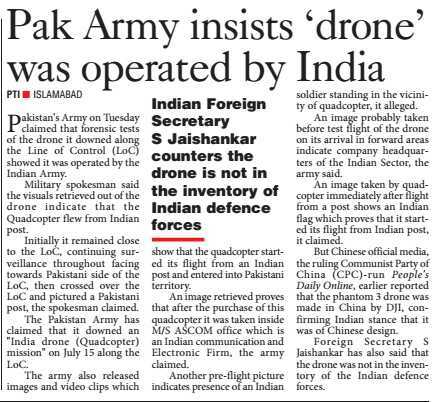 I am not on the vendors’ list of the Indian Army and therefore I have not sold any quadcopter, which the Pakistani Army claims to have shot down on July 15 on suspicion of spying on its soil,” he said. “These quadcopters are easily available on online shopping portals and could have been ordered from there,” Nichani added.